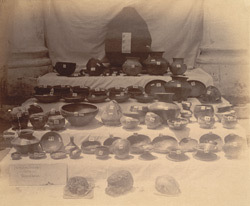 Photograph of a collection of prehistoric pottery from tombs in the Madurai District in Tamil Nadu from the Archaeological Survey of India Collections, taken by Nicholas and Company in c. 1882. Pottery is one of the oldest arts and crafts in India, originally fashioned entirely by hand and later thrown on the potters wheel. The Imperial Gazetteer of India mentions "several neolithic settlements and implement factories in Southern India...The pottery found in abundance at these settlements is described as being all wheel-made, and of very high class for Indian pottery." The Gazetteer goes on to say, "When the antiquity and high standard of Indian civilization are considered, the almost absolute non-existence of examples of the minor arts dating from past ages is astonishing. The only ancient pottery discoverable is that found in prehistoric cemetaries and megalithic tombs."